The Area Agency on Aging’s health and wellness programs are designed to help older adults (60+) through education and activity. AAASWFL also provides support programs for caregivers. These free workshops are available throughout our service area (Charlotte, Collier, DeSoto, Glades, Hendry, Lee and Sarasota Counties). All of our Health and Wellness offerings are evidence-based, which means they have been scientifically tested and shown to produce verifiable results for people that have completed the workshops. AAASWFL’s Health & Wellness programs are funded through the U.S. Older Americans Act. Did you know that falling is the most common cause of death and serious injury among older adults? Many seniors begin to restrict their activities because of concerns about falling. A Matter of Balance workshops are designed for seniors who have anxieties about falling or who have fallen in the past. This 4-8 week program helps older adults improve their balance, develop an exercise plan to increase strength and flexibility, and conduct a home safety check, among other topics. Tai Chi is a low-impact form of Chinese martial arts that involves slow, controlled, flowing movements. It can help improve hand-eye coordination, enhance health and fitness, improve balance, reduce stress and provide a gentle aerobic workout. AAASWFL offers two different Tai Chi workshops. Tai Chi for Arthritis for Falls Prevention is an 8-week, 16 session workshop. Tai Chi: Moving for Better Balance is a 12-week, 24 session workshop. Walk With Ease is an Arthritis Foundation fitness program that can reduce pain and improve your health. If you can be on your feet for ten minutes without increased pain, you can have success in this program. One-hour classes include group walks and health-related discussions. The Arthritis Foundation Exercise Program (AFEP) is tailor-made for people with arthritis. The AFEP is safe, comfortable, and effective. In one-hour classes, you’ll reduce stress and learn how to better manage your arthritis. Classes can be done either sitting or standing, depending on your ability and activity level. Caring for a loved one can be demanding and stressful. AAASWFL offers caregiver support programs. These workshops are available to caregivers of any age who are the primary caregiver for an older adult or person with a disability. Powerful Tools for Caregivers helps provide confidence, emotional management skills, self-care behaviors, and connection to local resources. Classes are offered in 6-week programs. 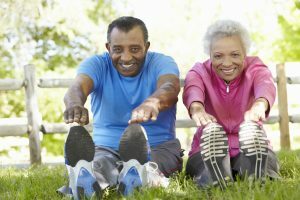 To find a Health & Wellness class near you, or to request a class at your facility, call the AAASWFL Elder Helpline at 866-413-5337 (41-ELDER). Check our events calendar to see if there are upcoming classes in your area.